Looking ahead to this Sunday’s New York City Marathon where over 50,000 runners will traverse the city’s five boroughs, we’re thinking about the roles that topography and urbanism play in the world’s longest running courses. The Abbott World Marathon Majors is composed of six races in four countries, including three in the United States. Though all the host cities are highly-populated metropolitan areas, they vary in size and density and all feature distinct geographies that change the way runners battle through the race. In New York, runners cross three major bridges and power through the city’s undulating terrain, some of it flat and some of it extremely hilly due to the Manhattan schist that elevates the northernmost parts of the Big Apple. One of the features of this race, and every race within the World Marathon Majors, is that it gives people—not cars—the chance to take over streets and other major pieces of infrastructure. 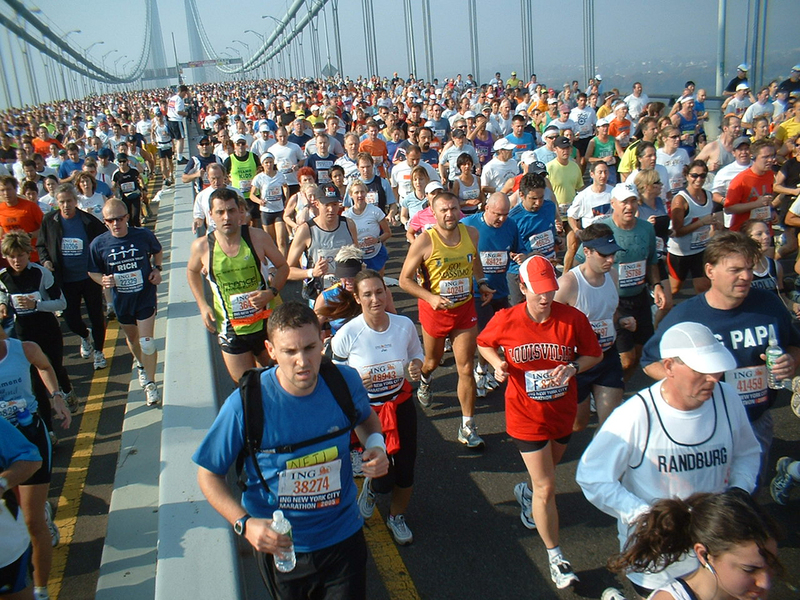 Now in its 48th year, the marathon starts at the edge of Staten Island. Runners get an initial high over the 13,700-foot-long Verrazzano-Narrows Bridge, a Robert Moses-backed project, and run north up 4th Avenue from southern Brooklyn to Greenpoint. After a brief stint in Long Island City, Queens dotted with shiny, new towering residential properties, runners cross the Queensboro Bridge and begin a six-mile jaunt through Manhattan, the Bronx, and back into Manhattan to the end in Central Park. As one of the world’s most walkable cities, runners will have plenty architectural distractions along the 26-mile route. But with a total ascent of nearly 853 feet and a maximum elevation of 195 above sea level, the long and swelling course in New York is not for the faint of heart. The youngest race in the World Marathon Majors, the Tokyo Marathon has existed since 2007 and features little change in elevation due to the city’s location on the coast of Japan. Rising to just 134 feet above sea level, but largely maintaining an average of 5 feet above grade, the extensive course zigzags through the heart of the city and across the Sumida River. The race begins at the Kenzo Tange-designed Tokyo Metropolitan Government Building, a 48-story tower that, though surrounded by other gray-toned architecture, still maintains its identity as a landmark in Tokyo. The building resembles a giant, cathedral-shaped computer chip. 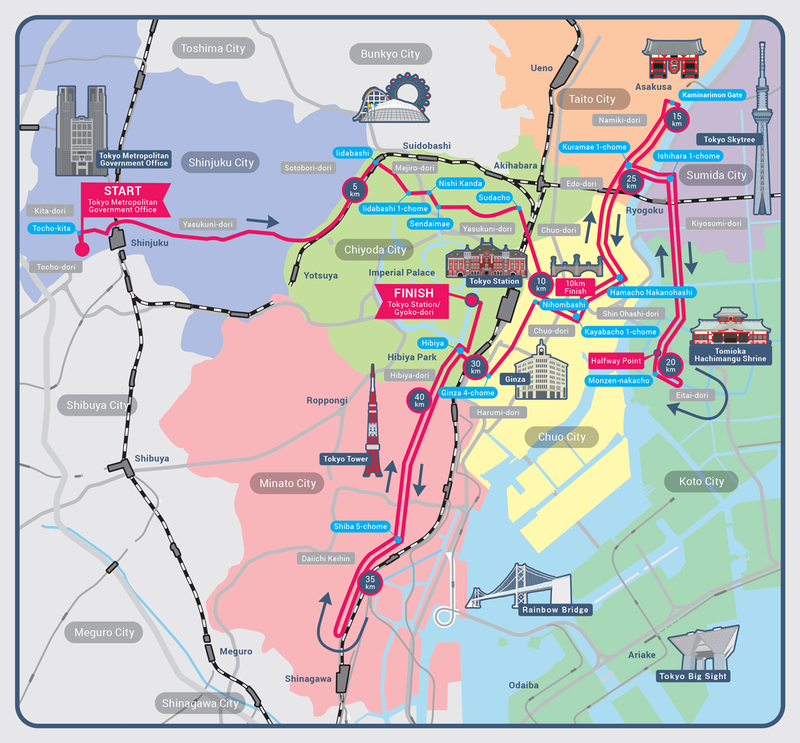 The course heads directly east toward downtown Tokyo past the 19th-century Imperial Palace, then loops through Asakusa, home of the famous Buddhist temple, Sensō-ji, down to Koto, through Ginza, and the Shinagawa business district in Tokyo Bay. Runners will end the race by cutting through Hibiya Park and hitting Tokyo Station. It’s the only course in the competition where participants double loop the parts of the route. As the world’s oldest annual marathon dating back to 1897, the Boston Marathon is also New England’s largest sporting event, attracting over 50,000 spectators and 30,000 participants. 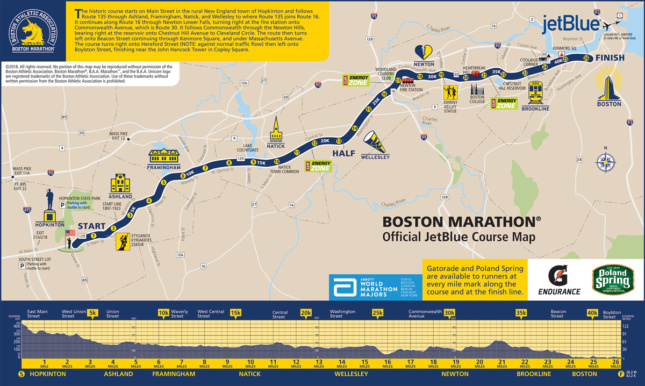 The historic course runs straight through eight cities and towns in the Boston metropolitan area, starting on East Main Street in Hopkinton and following Routes 35, 16, and 30. Finishers cross into downtown Boston and end near the John Hancock Tower in Copley Square after largely descending in elevation from the top of the course. The long route allows runners to explore Boston’s Middlesex County and race by the scenery between each colonial town. Overall, the race is very hilly. The course begins at 450 feet above sea level and drops drastically, eventually resting around the 150- to 200-foot mark from miles 3.5 to 15. From Newtown to Brookline at mile 19, runners will climb the infamous Heartbreak Hill before descending to sea level in the last two miles. 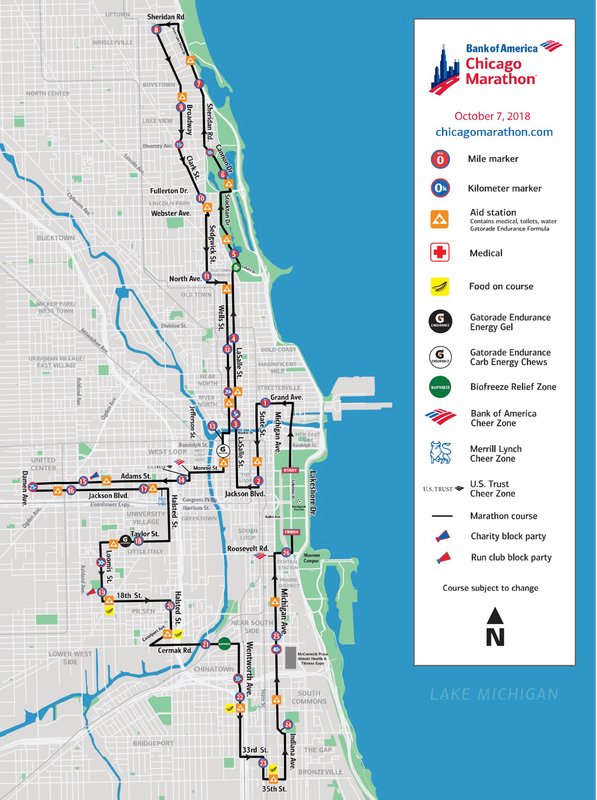 Beginning and ending in Chicago’s own front yard, Grant Park, runners go through 29 neighborhoods in one large loop, with each of the city’s main stadiums set as turning points. As one of the most architecturally revered cities in the U.S., runners have the opportunity to pass by some of Chicago’s stand-out structures and get a feel for its physical and cultural diversity. The 45,000 participants start the flat race in downtown Chicago, catching glimpses of Millennium Park, the mid-century Prudential Building, and the Loop. After crossing north up LaSalle Street to Lincoln Park, they’ll hit Wrigley Field at mile 8 before heading south to Old Town, which sports Chicago’s Victorian-era homes, as well as St. Michael’s Church, one of the only buildings still standing from before the Great Chicago Fire of 1871. In the industrial River North neighborhood, runners will fly by Merchandise Mart, home to galleries, as well as residential and design showrooms. On the West Side of Chicago, participants pass by the famous Union Station and St. Patrick’s Church, the city’s oldest public building, before hitting Little Italy, Pilsen, and all its wall murals, as well as Chinatown. Before heading back up Michigan Avenue to Grant Park, runners go by the campus of the Illinois Institute of Technology, which is next to Bronzeville, a place called the “Birthplace of the Blues.” In the historic Gap section of the neighborhood, Frank Lloyd Wright built a set of rowhouses. 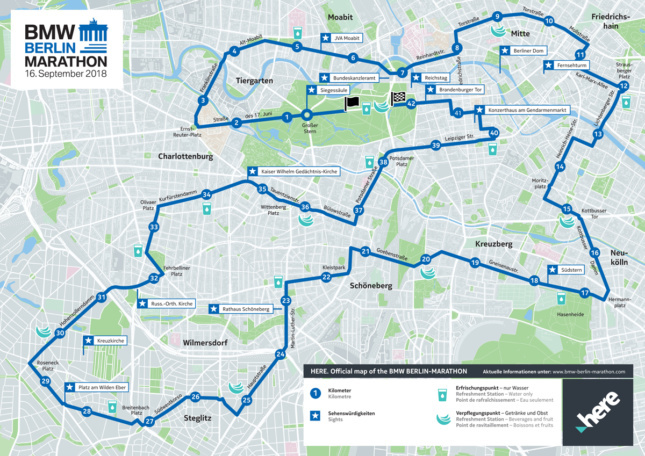 Established in 1974, today’s course for the Berlin Marathon hasn’t always been in place. Before 1990, the race was held solely on the city’s west side. Just months after the fall of the Berlin Wall that June, participants were able to run through East Berlin with tears in their eyes. The course today is configured in a large loop. It starts at 38 meters above sea level and never rises above 53 meters. It’s largely flat and features very few sharp corners, making it one of the fastest long-distance routes in the world. Runners begin at the neoclassical Brandenburg Gate in the historic Pariser Platz. They then head west through Grober Tiergarten Park before crossing the river Spree. Heading into East Berlin, participants loop through Friedrichshain, Neukölln, Kreuzberg, Schoneberg, and Steglitz, eventually going into Charlottenburg, and downtown Berlin. Because of the city’s stark past, Berlin is relatively young and many major developments are less than 30 years old. Runners will start in an iconic and old part of the city, but eventually stumble upon newer structures such as Norman Foster’s Reichstag building and Potsdamer Platz, the city’s main square with a masterplan by Hilmer & Sattler, and designs by Renzo Piano and Helmut Jahn. Following the flow of the River Thames, the relatively flat London Marathon attracts amateurs, charity fundraisers, and serious runners from around the world. It started in 1981 and the slithery course—which begins in Blackheath, passes through Greenwich, and ends in St. James near Buckingham Palace—has barely been altered since the original race 37 years ago. Participants travel through two of London’s major parks, visit dockyards, the Royal Artillery Barracks, and file through the neighborhoods of Deptford, Surrey Quay, and Wapping after crossing Tower Bridge. While the Tube is arguably the fastest way to get around London’s sprawling metropolis, running this annual race gives visitors a chance to see the city at their own pace. Some of the city’s most notable developments are directly on or near the River Thames, such as the near-complete London Bridge Station that’s been in the works for eight years.